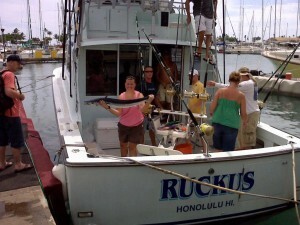 Lydia and her friends joined us on 8/23/09 and managed to reel in 5 really nice size Aku’s. Great job guys and Mahalo! 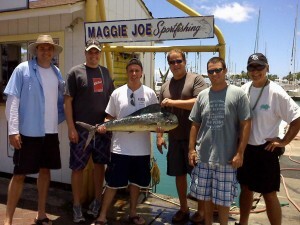 Bob and Brian joined us for a deep sea fishing adventure off the island of Oahu on 8/24/09. Mahalo guys! Mahi Mahi’s and a Wedding! Anthony and his buddies celebrated his wedding with a bachelor party on the Maggie Joe. The boys were able to reel in a couple Mahi Mahi’s. Congratulations and we’re glad we could share a great day with you! 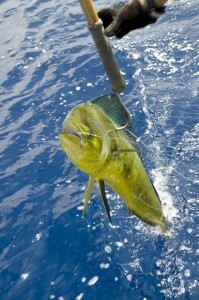 Mahi Mahi fishing can be great! They usually feed in schools so when they’re biting… they’re really biting! The fishing is fast and it’s furious! It’s also not uncommon to have several angler’s fighting fish at the same time. 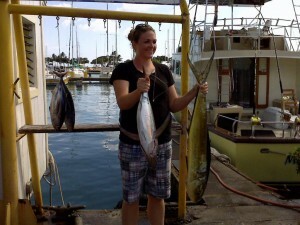 Posted in Deep Sea Fishing, Gallery, News | Comments Off on Mahi Mahi’s and a Wedding! 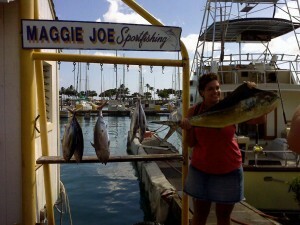 Megan caught this Ono aboard the Ruckus while deep sea fishing with us on Oahu on 8/20/09. Mahalo Megan! 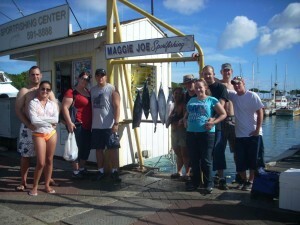 Robert Seeto joined us for a deep sea fishing adventure on Oahu on 8/20/09 on the Maggie Joe. Robert was able to reel in this Mahi Mahi. Mahalo Robert! 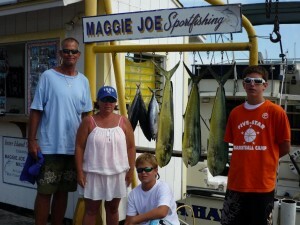 We’d like to thank Scotti Martin and her group of friends who joined us on the Maggie Joe on 8/21/09. 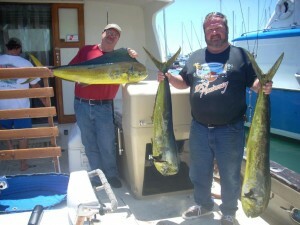 Together they reeled in a Mahi Mahi and several Aku and Shibi’s. Mahalo and we look forward to seeing you again! As you can see we’ve been catching a fair amount of Aku and Ahi lately. Both Aku and Ahi, both tunas, are well known in Hawaii for their great taste on a Sashimi platter. They also make for great fishing as Aku tend to feed in schools and the fishing can be fast and furious. 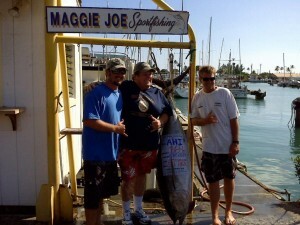 Ahi are known for their strength and fighting prowess and present a challenge to even the most experienced fisherman. Posted in Deep Sea Fishing, News | Comments Off on Who Like’s Sashimi? 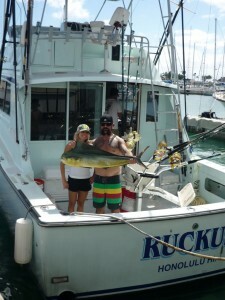 Brandon and Ashley Fletcher joined us on 8/22/09 for great day of sport fishing on the Ruckus. 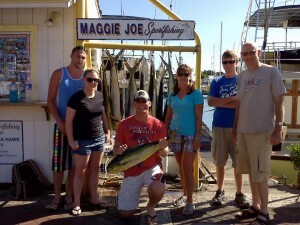 We had a great time bringing in this Mahi Mahi. Mahalo for joining us! 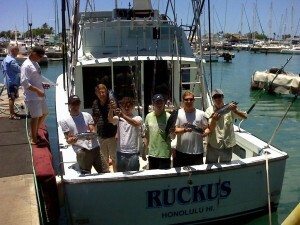 Mahalo to the Strayer family for joining us on the Ruckus on 7/24/09. After a beautiful day of deep sea fishing off Oahu, the Strayer’s were able to haul in 3 Mahi Mahi and 4 Aku. The most valuable information for any potential customer is to hear feedback from previous customers. 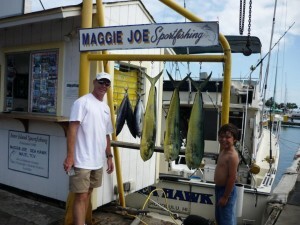 We would love for you to take a minute to share your Maggie Joe Sport Fishing experience with others. Just click here and tell everyone on google about your recent deep sea fishing trip. 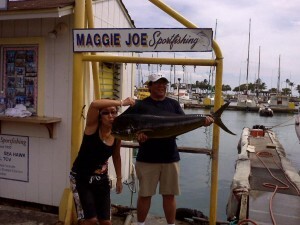 Feel free to share the story of your day, tell everyone about your catch and let them know why you chose Maggie Joe Sport Fishing. We know there is a reason everyone keeps coming back and we appreciate you taking the time to share that with others.